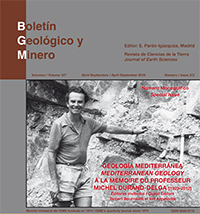 Tribute by the Algerian Geologists to Professor Michel Durand-Delga (1923-2012). The geological work of Michel Durand-Delga in Algeria. Tholeitic basalts and ophiolitic complexes of the Mesorif Zone (External Rif, Morocco) at the Jurassic-Cretaceous boundary and the importance of the Ouerrha Accident in the palaeogeographic and geodynamic evolution of the Rif Mountains. The Iberian Plate: myth or reality?